Max Headroom was a campy/classic/cult, made-for-TV movie (and later TV series) that first aired in the UK in 1985. 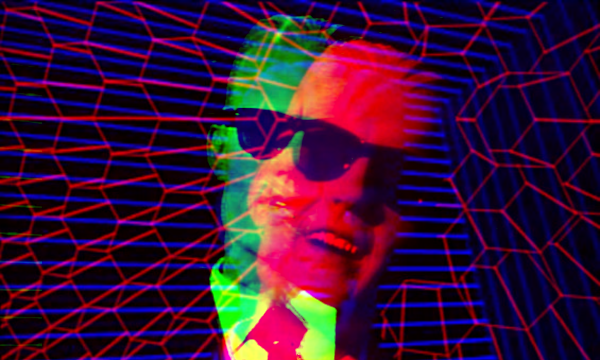 Max Headroom: Twenty Minutes into the Future takes place in a dystopian near-future, which from a 1985 perspective, roughly corresponds to our contemporary world. In this (this?) future, governments have been reduced to "Hollow States," while real political power rests with plutocratic media empires… the television networks. The leading media cabal… Network 23… has implemented an insidious mind-control campaign in the form of “Blipverts” …commercials that compress 30 second ads into 2 seconds. The only thing that is problematic with this otherwise very successful campaign is the fact that blipverts tend to make sedentary viewers spontaneously combust. Investigative reporter, Edison Carter, who works for network 23, plans to reveal his employer's plans to the world, but meets with an untimely accident as he is attempting to flee with his exposé. Carter’s consciousness is downloaded into a computer, which takes on a life of its own as the virtual presence… Max Headroom. Vintage cyberpunk wildness ensues, with Max ending up in the possession of a Pirate Television Station “Big Time” and it’s founder, Blank Reg. Max’s programming becomes self-replicating and he develops artificial intelligence and attains sentience. Sci Fi sit-com meets singularity. 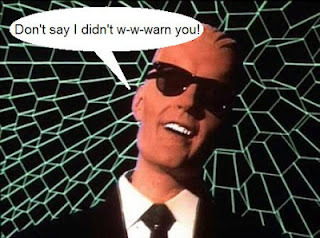 Max Headroom is quite remarkable as Sci Fi prophecy. Hollow governments, increasingly ceding power to media empires… a population increasingly hypnotized by said media empires… elections being decided by network coverage… a world where most technology, except those pertaining to centralized telecom and mobile technology, has been de-funded or otherwise discontinued… Renegade news reporters, eerily similar to YouTube i-reporters, taking on the networks to counter the “official story” …the list goes on.